Birds of Summer - Blog - Bird Feeders Etc. Blog - Bird Feeders Etc. 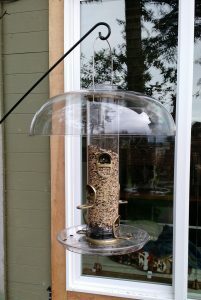 The latest news in the Bird Feeder World! 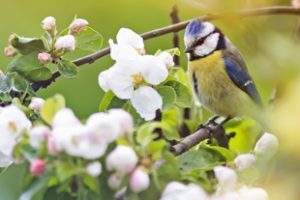 How can you attract birds during the warmer months? Contrary to popular belief, Summer is one of the best times to feed our feathered friends! However, to be rewarded with plentiful backyard bird guests, we must understand the needs these birds have during the summertime and how we, as Bird Nerds, can meet those needs and provide the best experience to our Summer guests. Birds that are likely to visit your feeder during the Summer, like Orioles, Warblers, and Hummingbirds, may not be around during the Winter, giving those dedicated Bird Nerds who leave their feeders up all year a larger variety of species to observe. The Summertime is when our bird friends begin to shed their bland winter colors and begin to don their flamboyant, breeding plumage to attract a mate, leading to a more colorful experience for any Summer birdwatcher. Nesting birds that feed in your backyard will often introduce their offspring to your feeders and bird baths as an easier source of food for their young ones (as I’m sure many of you parents out there understand), giving you a chance to view chicks as they grow up in your very own backyard. Warmer temperatures allow you to watch from a closer distance. If you sit out on a patio or deck, the birds who feed regularly from your feeders will become comfortable with you there and allow you to watch while they go about their business. Summer can be one of the most rewarding seasons to feed in, but we need to be aware of the best types of food that our feathered friends enjoy to munch on during the Summer months. Laying out a spread with as much variety as possible is the key to attracting the widest range of birds to your feeders. In fact, some species will also eat fruits and insects during this time! So, what are the best foods to offer in your backyard this season? 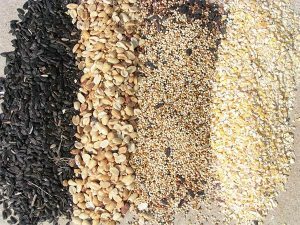 Seed: Seeds are always a viable option in any season, but the best type to offer during the summer months is any variety of black oil sunflower seed, which will attract the largest range of species to your feeders. Fruit and Jelly: Although not necessary, fruit or jelly can be a healthy, sweet treat for many different species of birds. Leaving fruit or jelly out in a platform feeder or a suet cage can attract cardinals, robins, or even woodpeckers, just be mindful that in the summer heat it can be easy for these treats to get rancid or moldy which could lead to sickness in some birds. Nectar: Although you may think nectar only attracts hummingbirds, several species, including orioles, woodpeckers, and nuthatches have all been spotted slurping up nectar at sugar water feeders. With their relatively simple set up and manageability, feeders like the Hummblossom are perfect for bird watchers looking for a little more color in their backyard or garden. Suet: Suet can be a great way to attract a wide variety of colorful birds, such as jays, chickadees and woodpeckers, while also providing a great source of energy for our avian friends during the long, hot summer days. Not all suet will withstand the summer heat however. Suet with a high fat content can melt and go rancid in the summer heat, so be sure to put out a low-fat, no melt suet blend, such as the Bird’s Blend All-Season Suet. Now we’re not saying that Summer is the perfect season for feeding, there are always difficulties during every feeding season, but there are always ways to reduce the effect of the nuisances. Other animals and pests like mice, raccoons, deer, and squirrels can see your feeder as a buffet spread and may visit expecting an easy meal. To discourage freeloaders from eating your precious feed, make sure all your feeders and ports are working correctly, that there is no spillage, or loose ports that could be interpreted as an open invitation for unwanted guests. If they continue to persist anyways, it’s advised to remove all feeders for a few days, forcing scavengers to find another source of food, after which, you should be able to put them back out with fewer problems, while still attracting nearby birds. High temperatures can also cause issues with your feed specifically. It’s incredibly important to check regularly for mildew, spoilage, and dirty feeders or ports to ensure that diseases or parasites aren’t spread to our feathered friends. To easily prevent this from happening, only put out enough feed to last 1-2 days. This will allow you to rest easy knowing that your feed won’t be responsible for getting any birds sick without too much effort on your part. 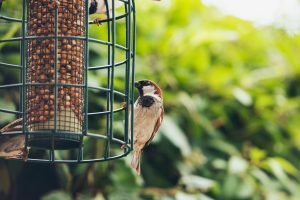 Lastly, there are a few easy tips and tricks that you can take that will not only make the Summer feeding season not only less of a hassle for you, but also even more enjoyable for the birds visiting your backyard or garden. To make sure your feed doesn’t stay wet after Summer rainstorms, which can lead to mold or mildew to form, use a mesh or open style of feeder as they will dry out more quickly. Another option can be to equip a baffle or rain guard to make sure your feed doesn’t get wet in the first place. Protecting birds from window strikes is a large responsibility of birdwatchers. By positioning feeders correctly, away from windows and out in plain sight in your yard, we can keep our feathered friends happy and safe while they feed. To attract an even wider variety of birds, ponder whether a bird bath, or fresh water source, would be suitable for your backyard or garden. This could be useful to both birds who feed already, as well as birds who need water as well, but don’t visit feeders as frequently. Summer can be a fantastic time to feed the birds , and if you follow these tips and tricks, it should be easy to enjoy dozens of different species of birds right in your backyard or garden!